King redefines comfort with the smart series LPW ECO2S. 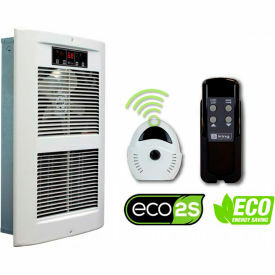 Combining a sleek and modern architectural design with the unparalleled performance, energy efficiency and user control of the ECO2S 2-stage electronic controller with remote. The LPW ECO2S delivers maximum energy efficiency with automatic 2-stage heating, automatically uses the lowest wattage needed to heat the room. Includes both fan only and timer mode options, as well as a remote control for simple operation. Now Available in 4 design colors to match any decor: White Dove, Oiled Bronze, Satin Nickel and Almondine. Motor Type: Heavy-duty, cast iron, unit bearing, permanently lubricated with 20cc oil reservoir, 1440 RPM. Enclosed impedance protected with intake air cooling motor for increased bearing life. King’s exclusive dual Pic-A-Watt steel fin elements allow customers to select from a range of wattage options, tailoring the heater to an area’s specific heating requirements, up to 4500W. Patented Smart Limit Protection: Disconnects Elements And Motor In The Event Normal Operating Temperatures Are Exceeded. An ideal choice for both residential and commercial applications. Now That’s Smart.